Our mission is to provide life-giving content and invite full participation in the great work at hand on Earth at this time. Embracing our “perfect imperfection” we invite all to live boldly, engage vulnerably and with open hearts to restore our bond of human community, and conscious, harmonious relationship with our gracious Earth, her kingdoms and All of Life. Our broadcasts seek to partner with every listener, guest, host and sponsor to foster personal, energetic sovereignty, mental and emotional freedom, vibrant physical health, creative dynamism and spiritual synergy stepping into the living experience of unabashed, unconditional self-love. 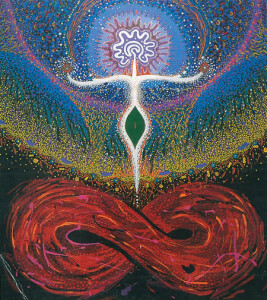 We seek inner dependence, interdependence and embrace dynamic balance beyond polarity – relishing the reciprocal blessings of the feminine and masculine energies coursing within each one of us. We honor all ancestors and connect to the Divinity in every life form and on every plane of existence. We embody the path of the heart, owning the shadows we have created, adopted and projected along the way (our karmas, conditioning and programs), transforming them into vast personal and collective awareness. Endowed with the powers of high magic and alchemy we creatively transmute our personal and collective mis-creations back to neutrality and bear witness as the foundational energies of light and love flood into the Earth Field. We know ourSelves as pure life force energy – in sacred Unity with All. As HumanSpirit we call in the future-now and relish a profound gift – to be Home while still embodied. We honor pleasure, play, sacred sexuality, activism and humor (please..!) while inhabiting the depths and heights of our personal and collective soul journey – destiny alive – as aware, eternal, inspired sparks of Source. We do our soul’s work, consciously, creating with all our relations a lucid, wakeful dream of beauty, harmony and justice throughout all worlds, especially attentive to our Earth community. Knowing ourSelves to be multidimensional, unlimited, eternal, creator beings, we intentionally partner with our most loving Spirit and inter-dimensional allies to bring forth our joint and highest destiny on planet Earth: a world that works for everyone in seamless harmony with a vibrant Earth and natural world. We dispel the illusions of fear, separation and scarcity. We celebrate each voice, each tradition, each unique lens through which Creator shines. For we know “I am you, you are me and we are One.” We live in the space of Unity and hold that space open even for our adverse-sayer-ies, knowing that we are each descendants and incarnational aspects of Source, playing out our roles and enacting our freewill choices. We know – because we’ve lived it – that all actions, choices, positions, beliefs and mis-creations are subject to a change of heart and consciousness at any time and we have faith in a more loving order. This is Who We Are ~ each and every ~ We are HumanSpirit. As a vital worldwide Network of like-minded, passionate, Creator Beings we welcome you, your dreams and the gift of your embodied presence on Earth, here and now. You belong here. It’s all been on purpose. Welcome Home.